We love Artisphere because it not only brings great artists to our town, but it also highlights the great artistic community right here in Greenville. From the Village of West Greenville arts district to the local artists involved in the festival to the Public Art Walking Tour to the Artisphere sculptures, there are a variety of other creative endeavors to highlight this festival weekend. Village of West Greenville– Artists, galleries, and local businesses. The Village of West Greenville has it all in terms of living local in Greenville. From The Village Grind’s lavender mocha to the Greenville Center for Creative Arts exhibitions to the Community Journals publications, you can always find your niche in the Village. Check out the newest public art on the side of The Anchorage Restaurant, painted by Sunny Mullarkey, local artist who also works in The Station. Local Artists- We love to walk down Artist’s Row at the Festival and point out our local features and our features from the past. Out of the 135 artists in the Row, 17 are local, and 94 are returning. Check out some more specifics here on the Artisphere website. Public Art Walking Tour– What better way to explore downtown and other areas of Greenville than the Public Art Walking Tour? 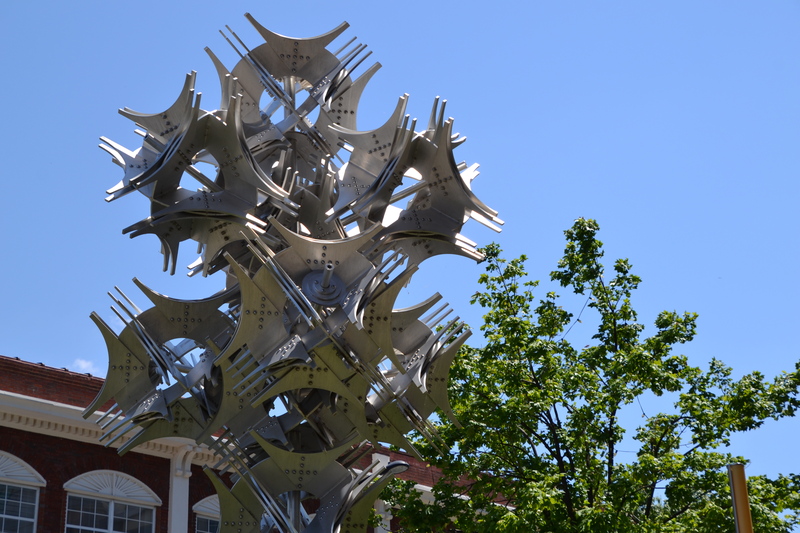 One of my personal favorites, the walking tour is created by the Arts in Public Places Commission to highlight the intriguing public art installations we have here. Most center along Main Street, but there are others if you venture to Stone Avenue and other surrounding streets. Artisphere sculptures- Artisphere celebrated its 10th anniversary in 2014 with a magnificent sculpture right on Main Street. John Acorn’s Ten Artispheres was dedicated to the City of Greenville and remains as an Artisphere beacon all year long. Paradigm Pathway, sculpted by Stephen Kischel, was dedicated during the 2012 Artisphere. Nexus of Light from sculptor Dennis Heimbach, located at the intersection of Main and Augusta, was dedicated to Greenville in Artisphere’s inaugural year, 2005.